Dealers setting up at Antique & Vintage Flea Market in Centreville, Michigan, were hit with a fast moving weather front that dumped heavy rain and pea-size hail over the fairgrounds about 6 p.m. Heavy winds threatened tents and sent everyone scurrying, but the weather quickly calmed down, bringing back the sunshine. No serious damage was reported. Ironically, show promoter Bob Zurko was away from the grounds because of injuries sustained in a show-related mishap at his annual all-night show on May 27 in Grays Lake, Ill. Zurko received a concussion and whiplash when a tent post broke in half, and as he said, “hit me real hard.” He had been hospitalized briefly and was resting at home during the Centreville show. Cousins Dan and Jerry Miller from Sharpsville and Peru, Ind., brought about two dozen fine refinished oak furniture pieces to the show. Catching many an eye was a 12-inch by 24-inch by 30-inch oak file cabinet with 18 wood front small metal drawers priced at $150; a 14-inch by 18-inch oak countertop sewing cabinet constructed from an old treadle sewing machine, $150; and an oddball pine and redwood teller’s cage for $75. More fine furniture was brought to the show by Jeff Guise, Hicksville, Ohio. The dealer pointed with pride to an 1880s 7-foot-long oak church pew with square nail construction for $225. For those who like the primitive look, he offered a 4 foot long oak cobbler’s bench, circa late 1800s, for $125. Guise said his usual load includes about 40 items, mostly oak, priced from $50 to $500. “I don’t ever expect to stop collecting,” said Dennis Crowel, 50, from Elkhart, Ind., as he showed off two 1930s hinged cast aluminum ice cream molds for sale at the show. They included a 4-inch-long duck and a 3-inch-tall bell, priced at $30 each. Across the field, Frank Hill of Muskegon, Mich., placed a vintage milk bottle from Grand Haven, Mich., on his table. The clear glass quart bottle was screen printed “Snyder Creamery.” Hill said pyros from Grand Haven are scarce and he priced it at $50. A 10-inch by 12-inch by 6-inch sardine tin shaped like a large book carried a price tag of $195. Setting up next to Hill, Randy Ball showed a selection of Indian arrowheads and old clay pipes brought from his home in Montague, Mich. Nine early Woodland arrowheads and a group of 1850-1870 clay pipes were checked out by collectors. Steve Peterson, owner of the Jay Garment Antique Mall in Portland, Ind., also showed off Indian items. An early 1900s 18-inch-long beaded and leather Crow Indian document bag could be yours for $750, and a “Sioux-type” tiny infant’s vest with crossed flag decorations was offered for $575. Barber and shaving enthusiasts looked over the large supply of vintage shaving mugs and related items offered by Ray Griggs, who runs Red Beards Antiques and Collectibles, Frankenmuth, Mich. Of special interest was a framed 18-inch by 30-inch full color advertising sign for Valet Auto Strop, circa 1920s, for $200. The bearded shop owner brought about 100 collectable shaving mugs to the show. 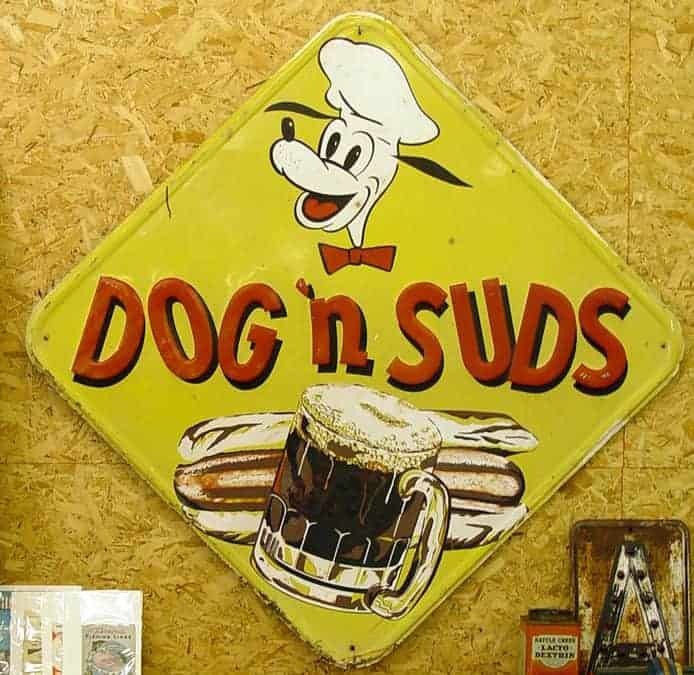 “I bought it right off the ceiling at a Long Island, N.Y., estate sale,” said Paul Funk, owner of Funks Junk, Waldron, Mich. He was pointing to an 8-inch-tall 1920s slag glass lamp with diecast metal Egyptian figures, priced at $300. Funk was in New York to gather items from a collection he purchased when he happened by the estate sale where he found the lamp. Although encouraged to sing “Let a Smile be Your Umbrella,” dealers Ken and Becky Ravell declined. The suggestion was made as the couple sat under an early 1900s 6-foot-diameter canvas umbrella advertising Voight’s Flour. The umbrella was priced at $175. Vintage crocks and jugs filled the booth of Knaomia and Wayne Fulton of Three Rivers, Mich. Of special interest was a 1 1/2-gallon jug with bluebird and stars design for $500 and a 5-gallon jug with blue bee design for $325. Both were said to be mid to early 1800s vintage. Foot traffic came to a halt at the booth of Marco and Adrienne Astrologo of Philadelphia, where they lavishly displayed Tiffany glass, fine lamps and high-end vintage handbags. Getting lots of attention was a pair of showy 31-inch-tall Fordyce lamps priced at $1,600. More than 500 designer handbags priced from $150 to $5,500 drew wide-eyed looks from shoppers.